This week, for example, I’ve had to run errands over my lunch break. On Monday, I had to take my son to the walk-in clinic to have a deep-set splinter pulled from his foot. (Ugh.) On Tuesday, I went to the dentist for a routine cleaning appointment. Both times, I thought to myself how convenient it would be to pick up lunch on the way back from these appointments, rather than take the time to make something at home. Where would I go if I were to pick up food? What’s on the menu that I would actually like the taste of? How will I feel after eating that? Do I really want to spend the extra money on that? So, after choosing to skip the take-out, I thought I’d share a peek at how I ate yesterday when I was feeling slightly rushed and busy. Morning: As usual, I made a shake for my family to share for breakfast. Today it was the Frosty Chocolate Shake recipe from No Excuses Detox. I make a double-batch of that for Austin and I to share, then I don’t rinse out the blender container and add in an extra splash of water, half a banana, and some frozen blueberries because my son likes his smoothies to be “purple” this week. Ha ha. Our baby isn’t quite into smoothies yet, but she is feeding herself frozen blueberries this week! I cut them into quarters so she can pick them up herself without being a choking hazard. 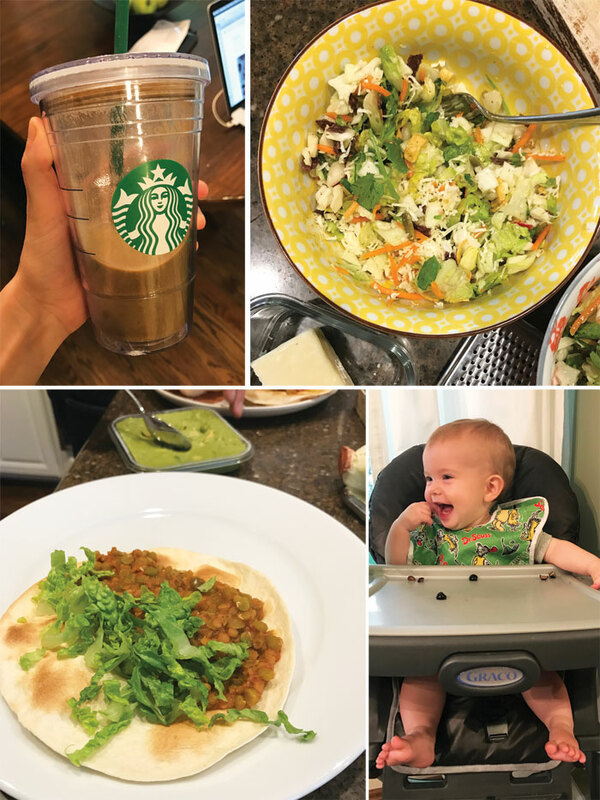 I’ll share more about how I’ve been introducing foods to her in the future, but you can read how I introduced solids to my first baby in my previous baby food posts. Snack: Before heading out to the dentist, I ate a Date-Sweetened Vegan Peanut Butter Cookie. Lunch: I had to run by Trader Joe’s on my way home, so I picked up their Southwestern Salad in a bag to share with my mother-in-law, who watched my kids while I was gone. I’m obsessed with the avocado dressing in this salad!! It’s not made with the best quality of oil, so I’m determined to come up with a homemade version in the near future. (Stay tuned!) 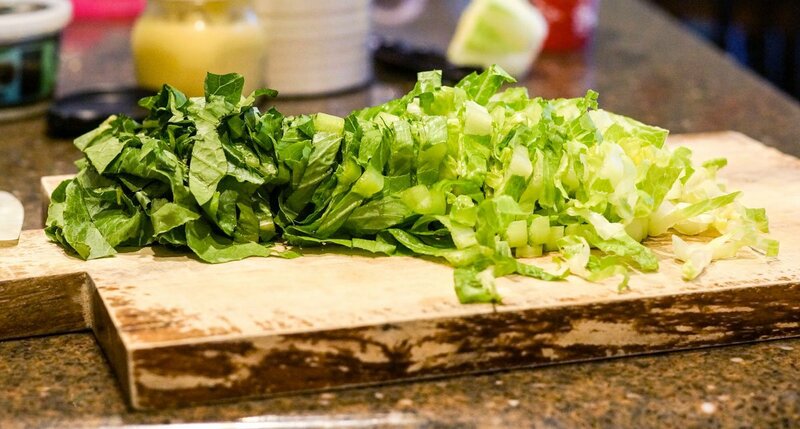 I like to skip the cheese that comes with it and add my own shredded raw goat cheddar, because I think the flavor is better, but it’s nice to have all of the greens and veggies pre-chopped for me. I love the addition of fresh cilantro and radishes! Dinner: My son had some friends over to play in the evening, so I threw together a few ingredients in the Instant Pot so that I could stay out of the kitchen while it cooked. I made a super-speedy vegan taco filling using no oil (I’ve been listening to lectures on how to reverse insulin resistance, and now I’m inspired to start cooking with less oil). I threw together some dry lentils with a jar of prepared salsa, water, and ground cumin and set it to cook until tender. (I originally tried 12 minutes at low pressure, but that didn’t work, so I added another 10 minutes at high pressure with a quick release and that was much better. There were still some tough lentils in the mix, so next time I’ll do a natural release of the pressure.) We served the filling in store-bought tortilla shells with store-bought guacamole and some chopped lettuce for quick and easy meal. Dessert: My husband has been talking me into making Peanut Butter Chocolate “Milkshakes” while we catch up on Season 3 of Fargo. I like to make extra and freeze the extras in our mini popsicle molds so my son can enjoy some healthy popsicles the next day for a fun summer treat. He ate the whole tray of popsicles yesterday! Which is fine, since he’s technically eating his smoothie, rather than drinking it…. Can you do a post on what helped you overcome binge eating? Thanks! Hi Megan. Thanks for sharing ! If we are trying to lose weight, would all those milkshakes help or hurt us ? What did you order at Starbucks? I love going there but I have trouble finding healthy options. What do you suggest? Thank you for your awesome cookbooks and your very inspiring blog! I love it! That’s actually a reusable Starbucks cup that was holding my smoothie! I think I stole the cup from my mom. Ha! But while we’re on the subject, my go-to drink at Starbucks is a quad-shot of decaf of espresso over ice, and then I add a splash of organic heavy whipping cream to make it taste like a super-strong latte. (I like really strong tasting coffee.) If I weren’t breastfeeding, I’d probably get the caffeinated version, but since I haven’t been drinking caffeine in over 4 years, the real version of that drink might have me buzzing!! It’s so fun to read these posts! I am intrigued by the no oil thing…is it just for cooking…I could do that but I’m wondering about baking and salad dressings/sauces?? Anyway, what have I been eating…I often struggle with the grabbing food on the run temptation, too, but like you, I don’t really like fast food and places like Panera are just way too expensive for more than rare splurges. Yes, that $10 dollars can buy salad ingredients for a whole week!! And since starting my streaming subscription to Physique 57 two months ago, I’ve lost 14 pounds and 18 inches…so no thanks, fast food! By the way I love these workouts and I HATE these workouts!! I feel like I’m dying every single time…but the results are unmatched and I’ve tried everything! So, smoothies in the morning..I’m partial to the Frosty Chocolate shake, too. Today, I also had a very light lunch of a strawberry, mango, date and kale smoothie, some baby carrots and gluten free pretzels with some jalepeno cilantro hummus. My husband is out of town on business, so for dinner, we had homemade creamy vegan tomato soup (which he hates!) and grilled cheese sandwiches on sprouted grain bread and made with sliced goat cheddar. And a big green salad with homemade honey dijon balsamic vinaigrette. And I made your vegan flourless black bean brownies, so dessert, here I come! I love your posts like this! I have a similar philosophy on food and really try to listen to what my body needs versus what my stress levels say I should do. Being busy and stressed always does a number on my digestion too, so most of the time, I try to eat to nourish my system instead of just rush through a meal or eat something I know will end up hurting later on. Money is also a huge factor in my food decisions; it’s why I’ve been cooking and eating healthy food at home pretty much every single day for a number of years now. I also love your books, especially your shakes and smoothies! 🙂 I am so excited you’re looking into cooking with less oil; I can’t wait to see what you share! I’ve been eating oil-free for 3 years now and it has honestly CHANGED my body and my blood sugar levels. I’m amazed I didn’t know about it sooner. Now, I gotta try out those cookies you shared! I made a Turkey Cauliflower Baked Ziti for dinners this week. I think it’s your recipe featured on Eating Bird Food’s blog. I happened to find it this weekend while meal planning. It was amazing and better than if it had real pasta in it! I made a batch of Whole30 compliant beef stew over the weekend that I’m doling out to myself this week. Also, I packed up some leftover chicken thighs and raw kale salad over which I poured the Ginger dressing from your Vegan Sushi bowls. Lastly, I cut up a big pineapple that I’m munching on throughout the day. Is that a flour tortilla that you’re using? We’re eating leftovers from our Kerala food dinner party last Sunday – Dal, etc. I love the questions you ask before eating out. Genius! I wonder if fast food is just a habit to some people.